the grooms mother at far end of shot has disappeared, only her hat shows, which she did not take off at all until several hours later. I have the 35mm neg to prove this is genuine. Taken in the De La Bere Hotel nr Cheltenham, one of the most haunted places in Glos. The URL you showed is correct. 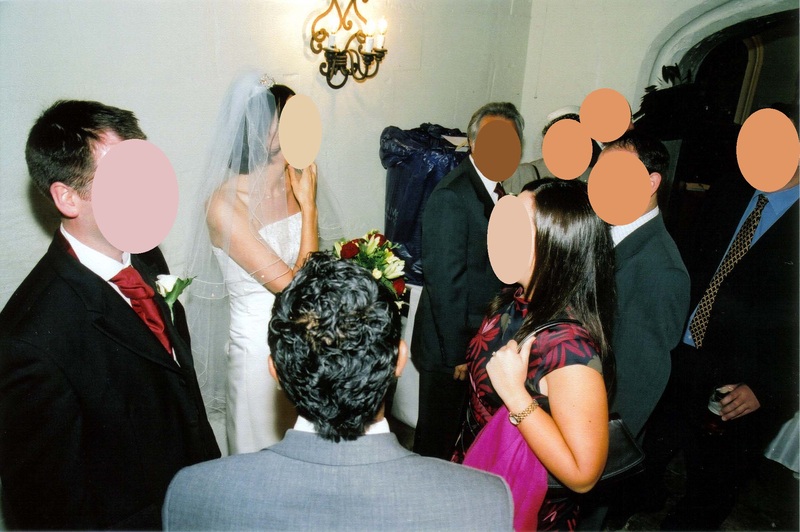 When the picture was taken, the groom's mother was not in the frame. The black shape you interpret as a hat is out of scale and would require a huge head to fill it. It is more likely a film flaw. Move-on everyone, nothing to see here. was it you who took the picy or were you there to witness that she was actually standing there when it was taken?